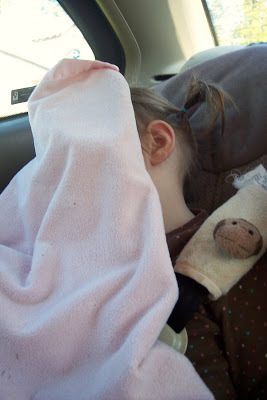 Sometimes she plays Peek-A-Boo under her blanket in the car, so at first I thought that is what she was doing. But I said “Where’s Cate?” and the usual prompt to get her to uncover herself wasn’t working. Because she was sleeping. Soundly. Soon after her sweet sleeping-breathing sounds were in full force.